You have described some conditions and/or problems that have persisted in spite of prior diagnostics and management. 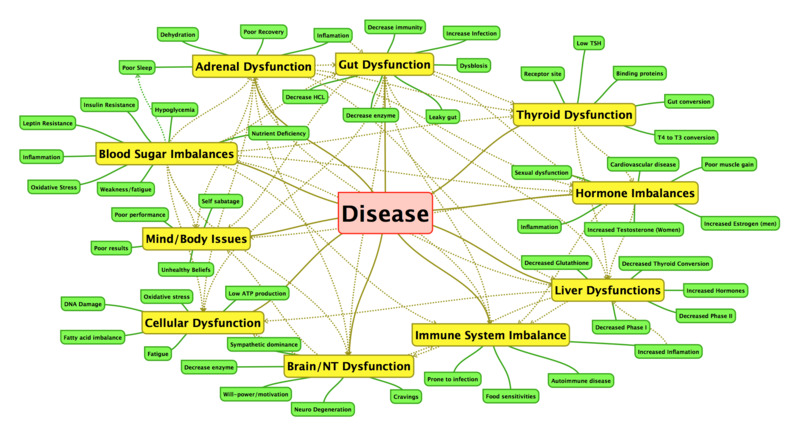 To assist you, we would analyze your health within a “Functional Medicine” model. Functional Medicine addresses the underlying causes of disease, investigating systems such as the gastrointestinal, endocrine, immune, and blood sugar metabolism to name a few. It is an approach focused on discovering the underlying causes of disease. It requires time be dedicated to reviewing histories, lab work and interactions among genetic, environmental, and lifestyle factors as well as food intolerances. By shifting the traditional disease-centered focus of medicine to a more holistic approach, making dietary changes and using nutritional compounds; Functional Medicine addresses the whole person, not just a set of isolated symptoms. Because of time constraints, Dr. Phelan can only accept a limited number of patients into the program and must confine this service to those enrolled in it. This is considered an uncovered benefit by insurance companies. In order to offer it, we have had to develop a fee schedule to provide this service. The fee is charged in advance and will cover the initial 5 visits. With some patients, additional follow-up visits and lab work may be necessary in order to further diagnose or monitor progress. This is a mutual decision, made after the initial 5 visit treatment plan is concluded. For more information regarding Functional Medicine, please read on. The result is front end savings for the for-profit companies, followed by escalating health care costs because of illness that develops, rather than being prevented. In our office we see an increasing number of under diagnosed, over-medicated patients that are told their lab values are “fine” … and they do not feel or look well. As a result, we find a need to play a larger role in the diagnostics and advocacy process for our patients. Choosing to invest some time and resources in exploring a Functional Medicine approach, is likely to make a significant, long term difference in your life and the lives of the people that depend upon you. If you are interested in learning more about our Functional Medicine treatment plans, please let the staff know. a. Immunosuppressant and corticosteroid drugs can reduce antibody production and cause false negative results. It takes 60 days for the medication to clear the system and allow the normalized production of antibodies, required for immune testing, to resume. d. Unknown cross-reactive epitopes from foods and microorganisms may stimulate the antibody production in the absence of a true antigen. Cyrex has already developed Array 4 in order to recognize the most common antigens in this regar. e. A gluten-free diet can cause false negative results on gluten protein/peptide test. Q: When should I go for my blood work? A: You will receive an e-mail from us on how to schedule your blood work. B: In order for Cyrex to provide the best results, on your oral fluid (saliva) and or serum (blood) specimen, shipments should be sent Monday through Thursday. Q: Where do I go for my blood work? Hours: Monday thru Friday 8:00am to 6:00pm (It is best to go Monday-Thursday in the am if possible so that the specimen can be mailed out that day) For faster service you may want to call the lab to schedule an appointment for your blood draw; however, I have been told by the lab that an appointment is not necessary. A: A Cyrex Specimen Collection Kit, Test Requisition Form, Blood Draw Authorization (generated when appt. is made) and your government issued photo ID (driver’s license, passport) are required to present when using a contracted Cyrex Draw Center. Non- contracted services will need all of the above, expect the Blood Draw Authorization. A: Cyrex contracted Draw Centers, do not keep Specimen Collection Kits in stock and do not have access to your Cyrex Test Requisition Form. You must bring all materials to the Draw Center before services can be completed. Contact your ordering healthcare professional if you do not have any of these materials.